Cooling Warming by the numbers | Watts Up With That? I get featured in this WSJ piece from “The Numbers Guy” Carl Bialik, but there’s a curious sentence in the first paragraph. The print version of the WSJ contains much more, including photographs and perhaps some graphs that I provided. I haven’t seen it yet. Perhaps readers can fill in those details. ← Why is 20 years statistically significant when 10 years is not? Surely it should have been ‘cooling during the last 13 years (according to land-based stats) and during the last 40 years (according to satellite stats)’ ? That’s my take on it anyway, but willing to stand corrected if wrong. cooling or warming. it has very little to do with human activity and I applaud the research and validation or refuting the claims. while all the science is on the side of the skeptics …the education system has been hammering the warming issue such that it doesn’t matter. 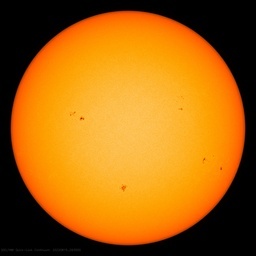 ..ask any grade school, high school or university student …they think we are warming the earth by burning fossil fuels. They do not know any other argument. the battle is in the wrong arena. William Briggs sums it up succinctly: the models are useless. I have read on this blog Re the BEST report that the earth has cooled this century. This is well supported as “this century” is only the past eleven years. I have read on this blog Rd the BEST report that the earth has warmed over the past century. This is well supported as the past century is from 1911 to 2011. Casting the WUWT statement that the earth has cooled this century as mean that the earth has cooled over the past 100 years is a good old straw man argument to cast Anthony as an unreliable Climate Change denier. I agree with General Malaise on the battle being fought in the wrong arena. The school system has been quietly whitewashing the wall of truth, creating a whole new generations of robots, some of whom are uncritically “occupying”…see the video of McKibben and a droning klatsch of parrots. What next, a UN Commission to tell us “wet” is an essential part of water? @Maurice Garoutte: Please give us a quote where Anthony has claimed that the earth has cooled over the past 100 years. If you cannot, then it’s you who raised a straw man argument. In the name of science, it hardly requires mention on this website that the models have no valid forecasting ability. They have been worse than that; their predictions are all worse than chance. But we do not need their forecasts to doubt them. Science demands they be published. They are not. Why take any of them seriously until they are? Especially since models do not conform to empirical scientific standards, publishing them is of even more importance, not less. …to cast Anthony as an unreliable Climate Change denier. What is it with these people? Since when has variations in temperature (I really don’t need to list all the ups and downs over the past several thousands of years here, do I?) have to do with the term “Climate Change denier”? Anthony would be the first in line under “The Climate Changes Here” banner and the rest of us would line up behind him. Now, if you have evidence that man is responsible for changing Earth’s climate, then you’re putting man’s impact on climate at least up there where it can be measured, quantified, and determined. The WSJ article points to Briggs, who has this post. Worth the read. Solve most current problems. Could easy be applied to solving CO2 problem as well. It appears to me that Maurice was pointing out that someone is confusing “this century” with “the last hundred years”. Obviously there is a large difference. Temperatures may have risen during the last century, but they have not risen in this century. I agree. I doubt CAGW. To me, these are the true issues. If AGW is correct then we open up land a few miles north for ag and more people. Is this what warmists fear? Just wait and see: “He who laughs last laughs better”, the coming winter and the following ones will be more expressive than words. To Richard Carpenter: Bravo!! I couldn’t have written better!! Dear Several, I don’t understand your quarrel with Garoutte. The man wrote plainly that for someone to confuse this century (2001-2011) with the last hundred years (1911-2011) would be a straw man to frame WUWT. What are you fuming about??? The BEST data only go to May 2010. I wonder what any one would predict about “next year’s temperature from past trends” based on the BEST data. It has definitely cooled over the last 17 months. If I were asked to make a prediction for next year’s temperature, I would use that site and say it will be cooler. As as matter of fact, it looks like 20 more years of cooling. Please read more carefully DCC and Anthony. This century started in 2000 and is now eleven years old. During “this century” the earth has cooled. The question is was Mr. Biliak’s misreading of “this century” an innocent misreading of the sentence like DCC or was it an intentional misrepresentation? 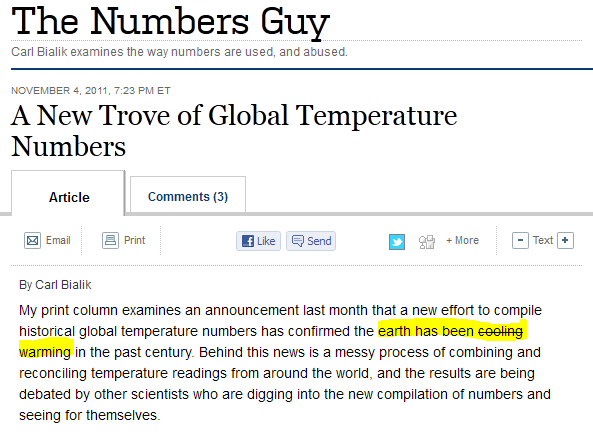 THE NUMBERS GUY, NOVEMBER 5, 2011. In addition to a picture of the infamous weather station in the Tucson, Ariz. parking lot, there is another picture attributed to Anthony. Thanks for putting it the way you did. I couldn’t agree more. According RSS data, there has been no warming for 15 years (1997-2011). If you assume a cold 2012, then it jumps to 18 years of insignificant warming (1995-2012). So the earth warmed last century. Cool. Maurice old boy, just WHAT is the “atmospheric time constant” by your estimation? 1 month, 6 months, 12 months? You seem to be missing a KEY POINT in the AWG “Claim”. CO2 is a “one way valve”. SINCE the atmosphere CLEARLY responds totally between 6 months periods (North Hem. and South Hem, Winter/Summer), we can probably safely say that the TC has been exceeded and the evidence does not support the “one way valve”. I read the article yesterday morning, and thought it’s pretty straight-forward, honest. Taking the Earth’s temperature requires more than lots of thermometers. It also relies on surveying tools, satellites—and confidence in statistical models used to put the numbers together. Still, those thermometer readings do matter. So a team of scientists recently tackled the job of cleaning up and organizing 1.6 billion temperature readings from two centuries and nearly 40,000 land-based locations. That required removing duplicate numbers, tossing out clearly erroneous records—such as temperatures above 5,000 degrees Fahrenheit—and fixing Celsius readings mislabeled as Fahrenheit. The process took nearly two years and has yielded a data set the project’s leader says can be analyzed in a matter of hours. “Before us, there was a huge barrier to entry” in the field of analyzing temperature numbers, says Richard Muller, scientific director of the Berkeley Earth Surface Temperature team and a physicist at the University of California, Berkeley. Plaudits are coming even from some scientists who dispute the conclusions of the Berkeley Earth team itself. The team analyzed its own temperature records and concluded that the Earth’s land has warmed by an average of about 0.9 degree Celsius (1.6 degrees Fahrenheit) since the mid-1950s. That is in line with some earlier efforts that used smaller sets of temperature readings. Some scientists reaching into the new database, while generally agreeing the Earth has been warming, disagree with details of the team’s findings. For instance, Berkeley Earth’s trend graphs, which reflect some modeling, show temperatures continuing to rise since the late 1990s. But the raw numbers show no definitive evidence of a increase in that time. The group also hasn’t made use of satellite-derived temperature readings. These show a smaller increase. The difference may reflect that some land-based weather stations aren’t well maintained. I’m inclined to give [satellite] data more weight than reconstructions from surface-stall data,” says Stephen Mclntyre, a Canadian mathematician who writes about climate, often critically of studies that find warming, at his website Climate Audit. Satellites show about half the amount of warming as that of land-based readings in the past three decades, when the relevant data were collected from space, he says. Such disputes demonstrate the statistical and uncertain nature of tracking global temperature. Even with tens of thousands of weather stations, most of the Earth’s surface isn’t monitored. Some stations are more reliable than others. Calculating a global average temperature requires extrapolating from these readings to the whole globe, adjusting for data lapses and suspect stations. And no two groups do this identically. The Berkeley Earth team uses a statistical tool it calls a scalpel to cut out data when there is a gap. It uses a process called Kriging to fill in gaps in data, borrowed from geoscientists and surveyors, who used it, for example, to estimate the elevation at point B that is between A and C, points where altitude is known. And it weights data more heavily from stations that are reliable than than from those that produce erratic numbers. The result is a statistical model of what the temperature was at any given moment at any given location. Actual thermometer readings, when they are available, are used only as fodder for the statistical model. Calculating a global temperature is necessary to track climate trends because, as your TV meteorologist might warn, local conditions can differ. Much of the U.S. and Northern Europe has cooled in the last 70 years, Berkeley Earth found. So did one-third of all weather stations world-wide, while two-thirds warmed. The project cites this as evidence of overall warming; skeptics aren’t convinced because it depends how concentrated those warming sites are. If they happen to be bunched up while the cooling sites are in sparsely measured areas, then more places could be cooling. The risk with models is that scientists can become enslaved to one they have chosen, says Mr. McIntyre. “The best antidote is for authors to make all their data available at the time of publication together with scrupulous documentation,” he says, crediting Berkeley Earth with attempting to do this. This century started in the year 2001. The year 2000 was the last year of the 20th century. There is no year zero. Work it out. “These fluctuations help explain why other researchers’ prior attempts to predict next year’s temperature from past trends have been unsuccessful. “The only way to prove these models are any good is to demonstrate that they skillfully predict new data,” said William Briggs, a statistician and member of the probability and statistics committee of the American Meteorology Society. Also, in the case of models used by BEST to fix bad data, I think one must deliberately corrupt known sets of good data by random selections of those errors that their algorithms are supposed to fix and then show how well the their models actually can restore the original data. For my own personal use, I once created a Gregorian Calendar, day of the week calculator program based on the simple fact that January first of the year zero AD (not a leap year and otherwise known as the year one BC) was a Sunday. I have wondered if this coincidence was intended by those who created this calendar. Lazy article from WSJ – a quote gathering exercise with no understanding or explication of the issues. Surely a science journo didn’t write this? Can someone explain why temperature records from cheap mercury in glass – wet and dry bulb – thermometers read predominantly by volunteers are way more accurate than sophisticated expensive satellite temperatures ? I’d really like to know the legitimacy of that. Years are a measurement of time. While there was no year “zero” we do not number our years like our months (Jan 1st, Jan 2nd) we count them. If you were born in May 1960 like I was you would be 51. But I’m in my 52nd year. Also consider the number line on the wall in grade school 0 is the beginning going forward so while there is never a 0 measurement there is a space between 0 and 1. When you were 6 months old your mother referred to as such. 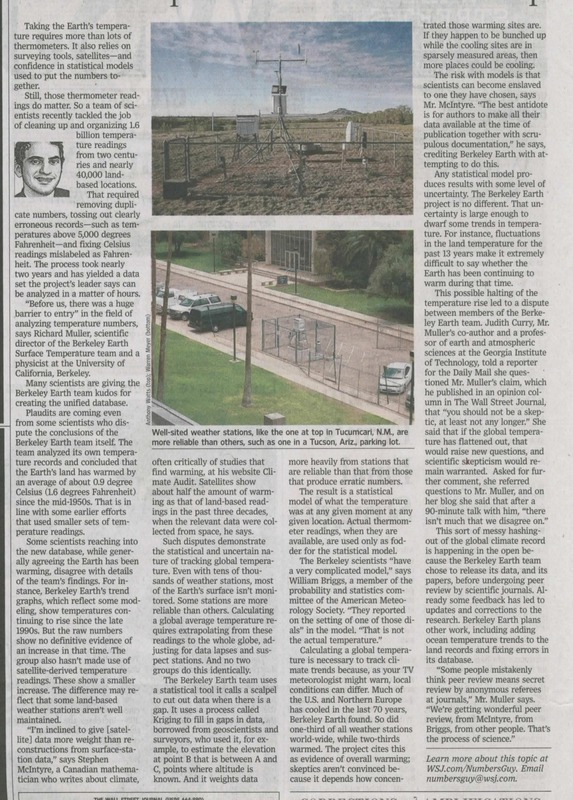 I do not know if I can accept the premise that simple thermometer records are more accurate than satellite records, as Anthony Watts has documented numerous cases where local temperature records have been corrupted by sensor placement in non-representative locations. But most of the sophistication and cost of satellite measurements is related to actually recovering Earth surface temperature data from outer space at great distances from the sites being measured. The assumed advantage of data from this source is that it gives frequent broad area temperature averages in places where minimal reliable local data is otherwise being collected. Years are a measurement of time. While there was no year “zero” we do not number our years like the days of our months (Jan 1st, Jan 2nd) we count them. If you were born in May 1960 like I was you would be 51, but I’m in my 52nd year. Also consider the number line on the wall in grade school 0 is the beginning going forward. So while there is never a 0 measurement there is a space between 0 and 1 that must be accounted for. When you were 6 months old your mother referred to you as such. Also consider that we call the 1900’s the 20th century. Surface air temperatures have been of much interest lately, as some scientists have detected an accelerating ‘global warming’ trend since 1980 (near 1,5°C per century), while others have detected more recently a significant slowing, and even a reversal of this trend since 2001, to near -0.5°C (-0.9°F) per century. This can be shown for the Climatic Research Unit and the UK Met. Office Hadley Centre data (HADCRUT3). Try the same with the ohers databases, and see for yourself how they differ, or not? Mathematically, there was a year zero A.D. That year is commonly referred to as the year one B.C. This is not a conflict; it is a matter of A.D. and B.C. conventions. Matters of convention are usually beyond the reach of logical reasoning. I would like to add a third “front” to Richard Carpenter’s excellent comment (9:29 am)–namely that before treating disease “X” with cure “Y”, we’d better be damn sure the cure isn’t worse than the disease–e.g., as someone recently said,curing a nose bleed with a tourniquet around the neck. So even if (a) “X” is happening (which in the case of GW appears to be completely dependent on the start and stop times) and (b) “X” can be called a disease (and as Richard eloquently points out, GW might be beneficial not harmful), we shouldn’t impose cure “Y” if the effects of cure “Y” are worse than the disease (supposed) “X”. Somehow I believe it just might be the case that limiting CO2 emissions to pre 1980 levels (or pick your own date) will cause humanity considerably more grief than a degree or two of global warming. Full of conspiracy theories and Skull and Bones. But it just might be correct. Lots of historical references and quotes from books. The sahara desert is not expanding but losing ground to the Sahel region which is re-greening after decades of desertification. The reason behind the re-greening of the Sahel is increased rainfall and CO2 increase. This is all peer-reviewed science, but it is hidden from us by the MSM, the IPCC and the warmists. But googling it would confirm what I m saying. An interesting fact that everyone is missing. The 20 – 40 year old global warmists and sea level rise alarmists all predict the tipping point for dramatic future change will occur around year ~2030. Well after they are fully tenured or retired.